I wrote a long diary piece for RPS about Shogun: Total War – Fall of the Samurai. They published the first three parts (one, two and three) but I never finished the final piece, as I couldn’t finish the campaign. The fourth piece, finished at last, is here and deals with Total War’s campaign games and their continuing failure to finish on a high – and quite a bit about pre-1945 Japan. The story so far; fearing the overrun of his home province of Fukishima, the cowardly Daimyo Reginald Samurai assumed a false identity as the Daimyo of the Satsumas. Talking to the old salts stationed at the British trading port, he discovered the existence of the Ironclad, a near-indestructible military ship. 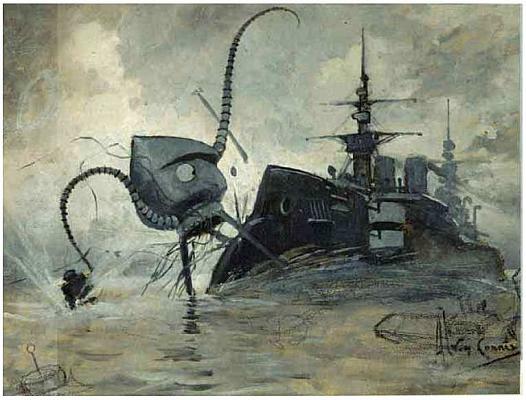 They told him tale of “the devil ship”, HMS Nemesis, a prototype iron warship which nearly single-handedly destroyed the Chinese fleet thirty years before. Reginald decided he was going to buy one of these ships, sail it and an army of Royal Marines up to the capital, and proclaim himself Emperor. Who could stand against such a ship? Who couldn’t love this beast that cannon balls just bounce off? Thirty years earlier, Reginald has a similar obsession. He thinks an ironclad, a proper modern machine of war, with all the gadgets that the bright shining modern 1860s can throw at it, a ship like that… it could take the Empire. In Aizu, he dreamt of surviving to the following day. In Satsuma, he can dream of on big gamble, one big ship and one giant army to go with it. It takes me a year to get a force together for Reginald to take the two provinces he needs to take and hold to win the game. Reginald takes all his best agents with him; Lacfadio, the Foreign Veteran, who has been drilling the three squadrons of Royal Marines. His Geisha, Tangerine, has been wooing them. Finally, Mandarin, his Shinobi, lazing in the summer sun. They, two thousand men, and an array of gatling and armstrong guns, clamber aboard the new British Ironclad, HMS Warrior, renamed HMS Thunder Child for the occasion. ( Yes, it’s cheesy, but it’s better than effing HMS Cockchafer.) Off to VICTORY! By the time my fleet sets sail, though, someone else on the Imperial side has already taken them and I can’t work out what I have to do next. The only objective I’ve not achieved is to personally hold a certain number of provinces, but surely we should have won by now? I’m confusedly partway through subjugating the nearest place with a railway station, just to find out how they work wh…. REALM DIVIDE. Okay, so, the Satsumas got too powerful. Though it doesn’t posit it like this, when you reach a certain level of power, the game gives you a choice between sticking with your faction and becoming a figurehead, if not the actual leader, or striking out alone. Reginald, having experienced the treachery and pettifogging luddism of both sides is in no mood for compromise. He’s in no mood to be the running dog of a man who owes his position to his a sliver of shared genetic material with a man a thousand years dead, whether that’s Emperor or Shogun. Reginald’s new aim is to raise the banner of the Satsuma over Tokyo. He’ll proselytise the benefits of Vitamin C to Japan or die trying. I’m at war with everyone! Not one of my allies has stayed loyal. Which is a bit rum. Diaries end. All real-world diaries have their cessation point. The playwright Joe Orton’s ended when his jealous lover murdered him. The 17th century minister Samuel Pepys ceased his diaries when blindness overtook him. Anne Frank’s diaries ceased when the Gestapo stormed her hiding place. Franz Kafka’s final letter demanded that all his works, diaries included, be burned after his death. The dancer Nijinsky only wrote his in the short period before he was put in an asylum. Yet, like most diaries, Reginald Samurai’s just faded out. He was never to raise his Mon over Tokyo because the game simply wasn’t interesting enough to maintain a strong narrative. I could have ploughed on, using the writerly arts to generate highs and lows, Dickensian cliffhangers with the ghosts of characters conjured from my fetid imagination. But the game didn’t turn out that way and the trudge to Tokyo became too off-putting. Partially, it was my fault. My part of the blame lay in flipping from the hardest possible situation to the easiest; Satsuma on easy mode, which proved more boring than I expected. But, mainly, this failure was Creative Assembly’s fault. When Reginald abandoned Fukushima for Satsuma, it was because I felt the game was cheating. On hard mode, the enemy factions were simply abandoning their strong positions to rush headlong at me, acting as a single enemy rather than a fragmented country I could divide and conquer. And the stupidity of the Realm Divide AI broke it completely. Like Julian Gollop told me at GDC, AI has just stagnated over the past 20 years – and AI has always been a bugbear for Creative Assembly, who seem to be unable to cope with it at all, with the now-defunct Darth Mod doing the job much better than they ever did. Creative tell us that the Total War games are rarely surpassed in the amount of time players put into them – but, still, reading forums all you see is players complaining about the AI. About it not using its navies in Rome I, about it cheating here, there and everywhere. I love the Total War games – the design, the historical context, their increasing tendency to gamble with the multiplayer – but I’m starting to wonder how many people actually finish them, and whether they’re about to alienate their audience. Rome II needs to do much, much, better.